As part of our advertising fulfillment services, Spire Express excels at re-purposing content for different medium or publications. Bring us your creative files and we will store them, sizing as need be. We’re good at making your design fit the requirements of the publication while maintaining the intentions of the original design. While preparing your files for resizing we’ll preflight the source files, repair color model mismatches, optimize graphics, cull out unused colors, and spell check. This more efficient, lean master will then be used for the basis of all resizes. If there are changes to creative midstream, we’ll make it to the master so that going forward all publications will be up to date. Frequently we’ll create multiple masters if the plan calls for them (full page, half page, vertical third, etc.). These master files are then served up via ftp to you as well so you may pull from them as necessary. Creatives are backed up weekly and carried off-site for disaster recovery purposes. We resize ads created in Indesign, Quark Express, Illustrator, Photoshop or Freehand. Although Quark Express constitutes the majority of our experience, Indesign is the frontrunner on ease-of-use for sizing. 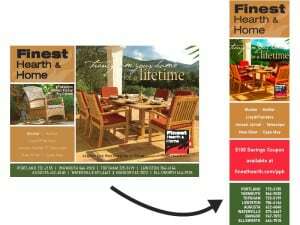 For that reason, ads may be translated into Indesign early on to make the last-minute resize smoother and quicker. The sized ad is stored in our job queue (separate from the creative), backed up frequently and can be returned to you on CD.